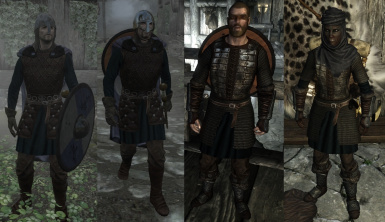 A clothing/armor overhaul that merges and extends V30's mods, giving the game a more historical Dark Ages/Early Medieval feel, by replacing various vanilla armors and adding tons of new sets. Support for Falskaar, Helgen Reborn, 3DNPCs, and BS Bruma. 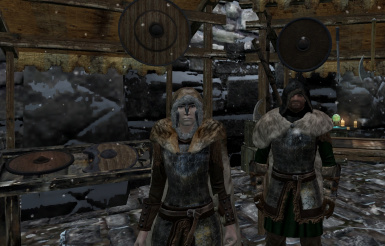 Hotfix 4.7--Fixed Tsun's armor, added new heavy nord shields in various colurs, sold by local blacksmiths. Added splinted steel gauntlets with recipes. Various changes/fixes for leveled lists. Hotfix 4.3--Fixed female Forsworn mantle's clipping, and other mesh improvements. 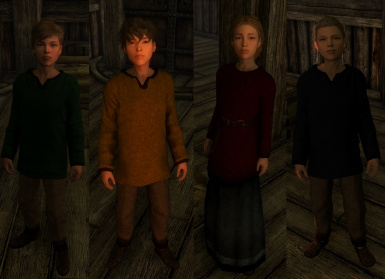 Added new surcoats for Falkreath, Riften, Whiterun and Companions. More to come soon. 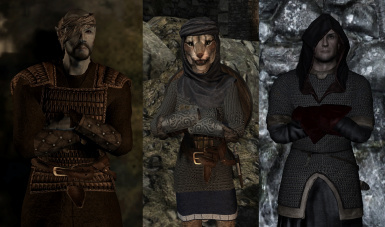 Added new scale byrnies with numerous variants to leveled lists of Forsworn, Bandits, and Stormcloaks. New Nordwar dwarven helms, plus new mail gloves from jomalley12211's mesh. 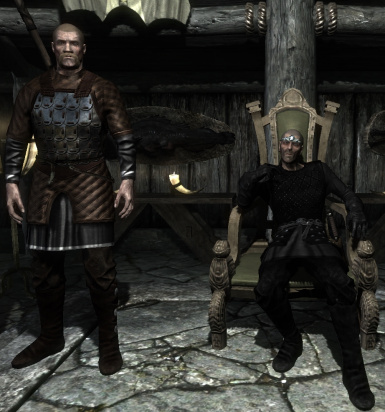 V30E Beyond Reach Patch--BETA TEST--Replaces Witchmen gear with V30E Forsworn lists. Will add more over time, eventually making it completely compatible aesthetic-wise. Place below V30E main file. 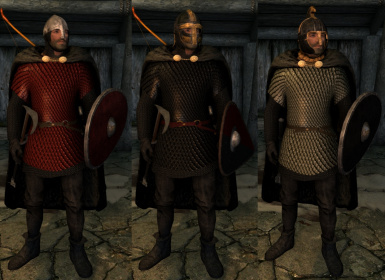 Hotfix 3.8--The last vanilla armor holdouts finally replaced--Daedric (for players of all races, but left the Dremora in their otherworldy plate, though I'm open to replacing it as well), dragonscale, and dragonplate, all with ebony hauberk and scale cuirass using Archduke's mesh. The shields are replaced with either the new oval shields from Nordwar, or V30's kite mesh. The helms are ebony re-textures of V30 Early Medieval Valsgarde and nasal. I've also replaced Ysgramor's, Auriel's, and Spellbreaker shields, as well as Savior's Hide armor. 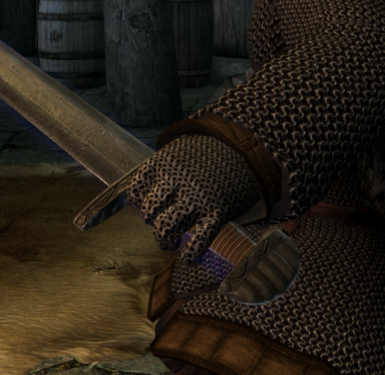 *Fixed clipping of armor and gloves/gauntlets for Alik'r and Simple Hauberks, as well as 1st person meshes. *Added Tsun outfit from Historical Revival. Imperial Patch 3.5--Numerous fixes, including updating heavy guantlets. Added V30E Weapon Replacer Beta. You must have Chronicles of Steel installed. See sticky post for details. Hotfix 3.4 Added missing textures and fixed some other bugs. 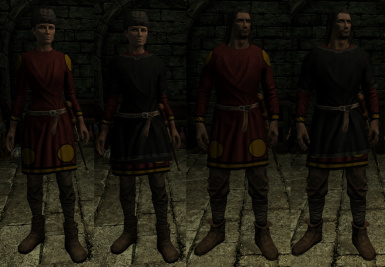 Hotfix 3.3 Uploaded proper male mesh for guards and mail byrnies. 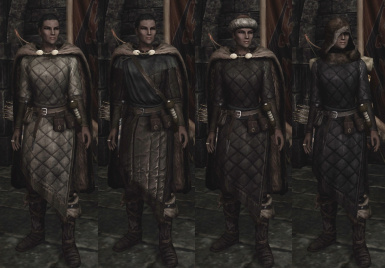 V30E_Dawnguard Patch 1.0--gives the Dawnguard and Vigilants of Stendarr new surcoats, also adds variant armors and changes both factions outfits to add more variety. You must download Hotfix 3.2 for the new assets, and load V30E_DawnguardPatch below the main mod--it's dependent on it, not a standalone--or you'll get a ctd. 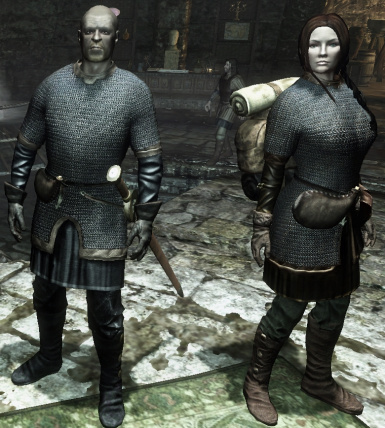 DSR users will need to re-run their patchers for the new Dawnguard shield to be worn on back. 1. New conformity of the overhaul, with an eye toward the period 500-1200 A.D. No more plate armor or high fantasy. A new weapon replacer mod will be released soon to compliment these changes. 2. 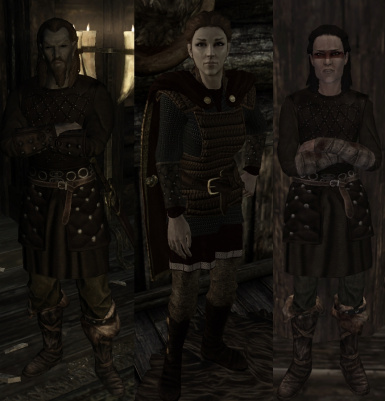 New replacers for Nord Plate, Ebony, Elven, Glass, Vampire, and Orcish armors and shields using content from Archdukeoflandsee and Grey_Hunter. 3. 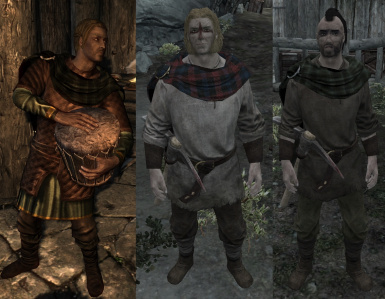 New Forsworn mantles and leveled lists additions, giving the Reachmen much more variety. 4. 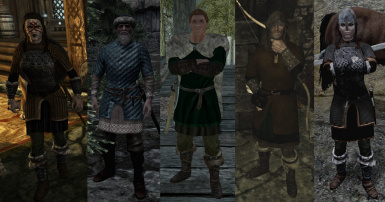 New simple Nord tunics, various splinted gauntlets and boots, along with countless revamped leveled lists, shop inventories, outfits, etc. 5. The Imperial patch is completely revamped, with much more variety, including new content from Archduke and Grey_Hunter. 6. 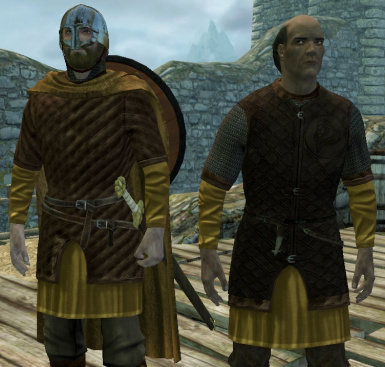 The Nord Plate Replacer Addon is now moot--with the Nord plate armor now replaced by a heavy mail hauberk--but a dummy esp. is uploaded for current saves, to keep your load orders intact. It should be jettisoned at the earliest opportunity. 7. 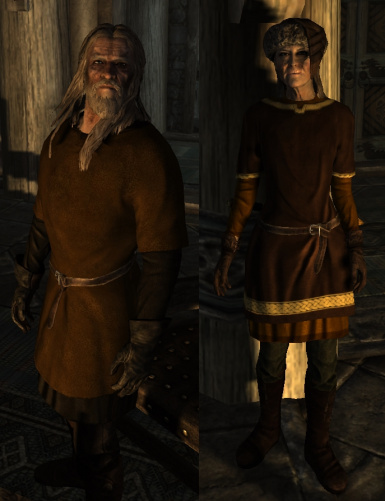 3DNPC patch has been updated to the new mod, specifically giving Erevan and Hiram the new mail hauberks. Hotfixes 2.0--2.4 added various missing assets. Will be updated until everything is fixed, followed by the main mod and various patches. *Fixes inventory icon for stalhrim heavy helm. *Changes the female light imperial boots from vanilla miner boots to match the male mesh. 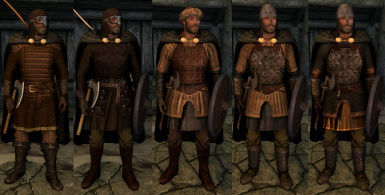 *Solidifies the Nord/Skaal outfits on Soltheim, making them consistent in style and utilizing the new V30E stalhrim and Nordic carved sets. 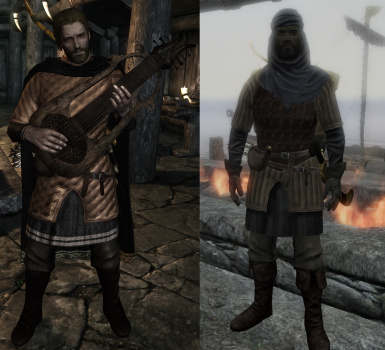 *Added brown leather re-texture for stalhrim boots and gauntlets, using minermanb's Steel Plate Replacer. *Replaced stalrhim shield with model from TheMalfazar. 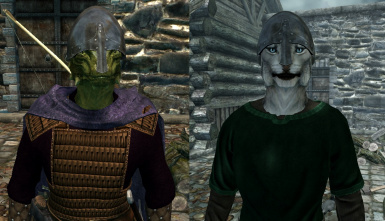 *Added Nernie's gambesons to more leveled lists (though they are still most common on Solthheim and with Elves and Khajiit, as I've conceived of them as an armor not native to Skyrim). *Numerous fixes/additions to leveled lists and store inventories. Updates to Test27, for those who already have Test26, and want the quicker DL option. Gives General Tulius better gear for battle--heavy armor and shield, and officer's helm. 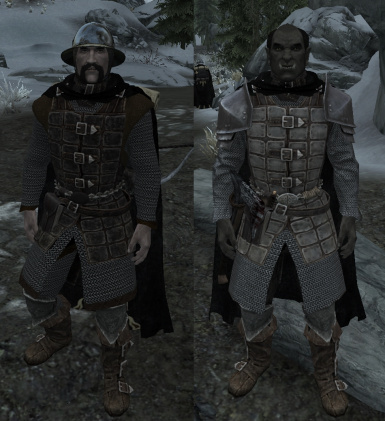 Adds leather gambesons from Nernie (can be crafted, tempered and purchased from various merchants ), Nord merchant clothes and hat variants from Romanov Couture (can be purchased at Radiant Raiment, Arnlief and Sons, etc), replaces Summerset Shadows and Karliah's armor with gambesons from Nernie, replaces light and heavy stahlrim sets with armor from Simple Hauberks, adds keyword compatibility for users of True Armor, Khajiit caravans get unique outfits, gives Ulfric unique armor for CW battle, fixes female 1st person gloves, as well as inventory icon for female iron armor, fixed Forsworn leveled lists so that the melee fighters now wear more variants as intended, numerous other tweaks, fixes, and additions to leveled lists, NPC outfits and shops. Updates to Test26, for those who already have Test25, and want the quicker DL option. 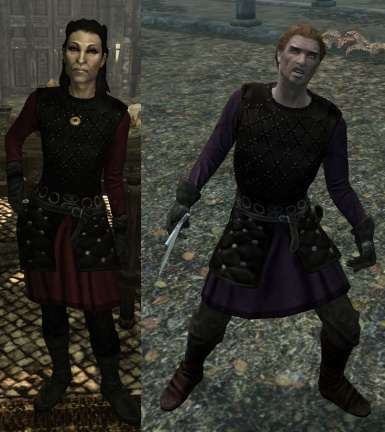 Improved the stats of Tulius' armor to better match the new Ulfric armor (we must be fair, no?) and various minor fixes. DSR users should not have to re-run their patchers after updating (knock on wood). 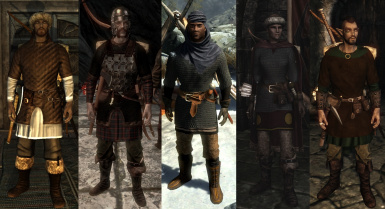 Replaced ebony and daedric armors with assets from W3 Toussaint Knight Armor Collection, added new variants of Nord tunics and new texture for vanilla ebony mail, created new outfits for npcs, made numerous changes/fixes to leveled lists and shop inventories. Patch20--Fixed upload. If you already have Patch19, you can simply use this to update to Test25 to save the DL time. Just add to your Data folder and overwrite original esp. Helps integrate 3DNPCs and V30E, fixing discrepancies in various 3dnpc outfits, adding to shop inventories, etc. 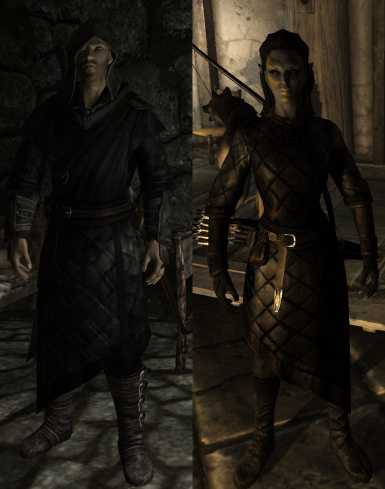 Added re-textured cloaks for those who use BS Bruma Tweaks and Enhancements, to better match the Bruma guard armor. There is no need to update if you don't use the added cloaks. To be clear, the BS Bruma Tweaks and Enhancements cloaks esp. is still required for the re-textured cloaks to appear in game. See new pics to see the new cloaks in game. 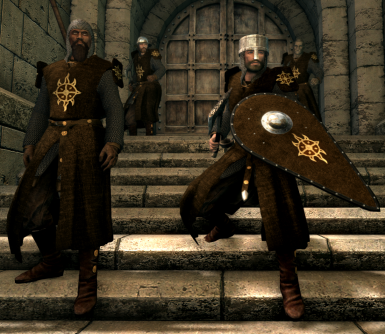 Imperial patch 2.1--fixes leveled lists for Imperial outfits, adding shields to the basic heavy troops--which in vanilla Skyrim are missing for some reason. Imperial Patch 2.0--Finally fixed Imperial shields! 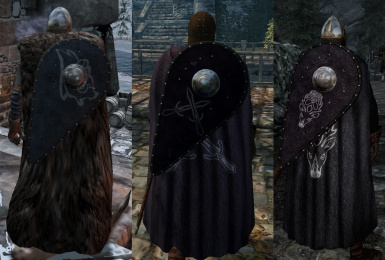 DSR users must re-run their patcher and delete the old Imperial shield meshes in their Skyrim/Data/Meshes/Armor/Imperial folder, because if not, DSR will mix up the shield on back meshes. Numerous fixes and additions/changes to leveled lists, added vanilla skeleton fix to meshes. Patch 18--simply adds new esp with above changes. Imperial Patch--updated to 1.3, fixed some issues. 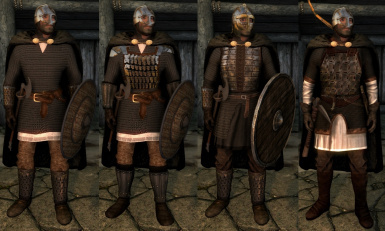 Orcish armor replaced with Croc's Viking mail, Vigilant robed plate from Madcat221 re-textured with V30 mail, Dawnguard heavy armor and heavy gauntlets replaced by Croc's Cyrodiilic chainmail re-textured with V30 mail, plus numerous other additions and fixes. V30 Imperial Patch 1.1--Added missing textures for Penitus Oculatus belt. Replaces all Imperial armor, helms, and shields, with V30 assets. You must have all the meshes/textures added by Test 21. Place the Imperial patch esp. just above V30E in your load order. 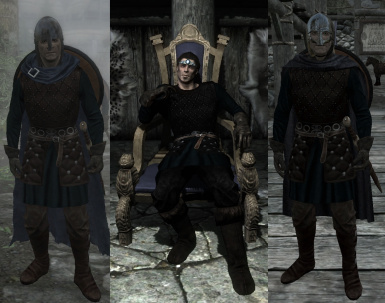 Adds new helms from Nordwar, numerous new outfits for various NPC's across Skyrim, additional fixes and tweaks to leveled lists. 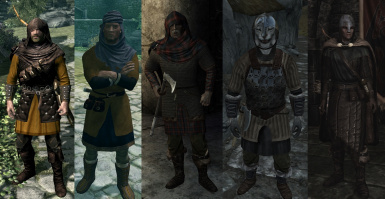 Replaces hide, iron, steel, and banded shields with content from TheMalfazar; replaced vanilla iron and banded iron, and Dark Brotherhood armor with appropriate v30 content. 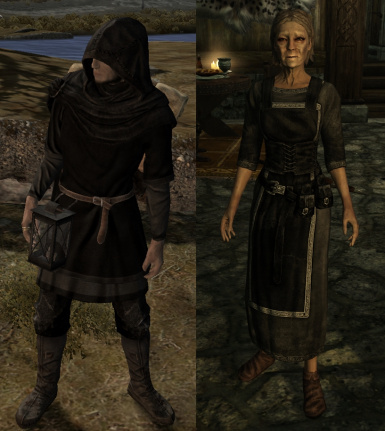 Made Nightingale armor more distinct, as well as Thieves Guild variant, to separate it from hide scales, plus numerous fixes and additions. All new shields are DSR-ready, just run your patcher. To be sure that DSR doesn't get confused and use the old models, you should delete the old shieldonback meshes from the various folders i.e. hide/iron/steel in your meshes/armor folder. Added new variants to Stormcloak and Forsworn leveled lists. 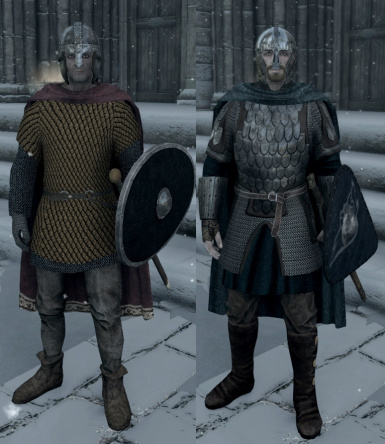 Note on Iron/Banded--The iron and banded iron armors are now called 'Nord Iron Plates' and "Nord Mail and Iron' respectively. They are each heavier and one point of protection less than the 'Housecarl' versions of both armors, which are also more expensive. The housecarl versions are also keyworded for both iron and steel perks, while the lesser versions are only keyed to iron, and have a slightly different look--i.e. brown leather pants as opposed to green wool. Hotfix Patch15--Adds missing meshes. Install if you have updated using Patch14/15. You shouldn't need if you DLed the main file--version 19. 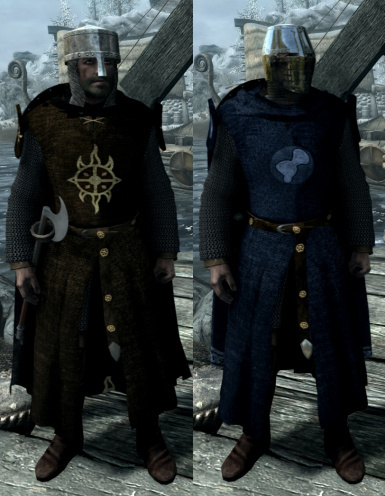 Added Falskaar patch, which replaces armor for both sides of conflict, as well as jarls and housecarls. Place above V30E in you load order. I messed up and uploaded wrong file for Test17--it's now fixed. Uploaded a fixed Patchfix--fixing wrongly placed meshes. Feel free to delete any nif. files from your Texture/Armor/Vaultman30/mehelmets folder, though they shouldn't harm anything if left there. 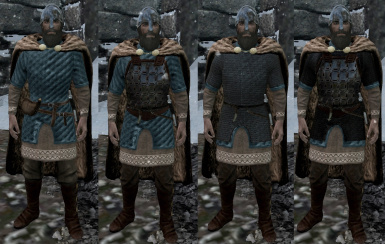 Added missing meshes/textures, added various V30 helm and shield re-textures by Grey-hanter, added craftable housecarl armor, fixed numerous beat-race meshes for helms, replaced vanilla leather helm with appropriate Grey-hanter re-texture, added Grey-hanter shields to Stormcloak leveled lists, numerous other fixes. Those using DSR should run their patcher so that new shields will be recognized. Also, you should always rebuild your bashed/merged patches after an update, to be certain that changes to leveled lists and shop inventories are updated. Fixed missing meshes/textures not included in original download. Fixes some bugs in the latest patch--fixed beast race iron helms, added helm rivets and plates for recipes to blacksmith inventory, fixed inventory icon for scaled armor, and other additions. 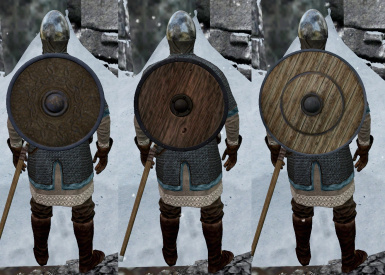 Also added V30E Nord Plate Replacer addon patch--Adds variants--brown, blue, green, purple, and mail texture to sleeves--to minermanb's Nord steel plate replacer mod. 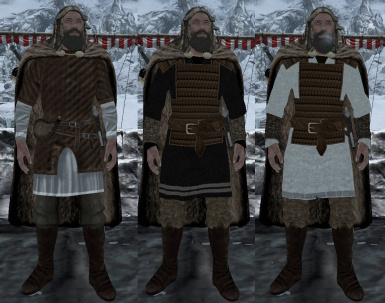 Adds replacers for studded, hide, and scaled armors, adds some additional Stormcloak variants using textures by yoshimuji, added various housecarl armors to leveled lists/outfits, added appropriate armors for various mercenaries--i.e Black-Brier guards, Blackblood Marauders, East Empire guards, etc, added new white and black tunic variants for various armors, added keywords to numerous armors for better perk adaptability, fixed those gods-damned Stormcloak officer outfits--got rid of those stupid spiked bear boots--and added new variants, and many other fixes/additions. 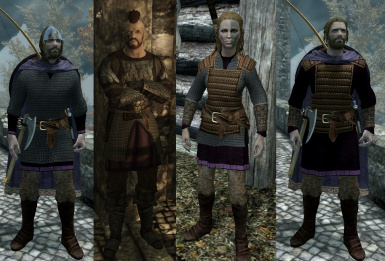 Added Riften (purple tunic) hauberks, new Whiterun (gold tunic) armors, numerous leveled list/shop additions, and bug fixes. 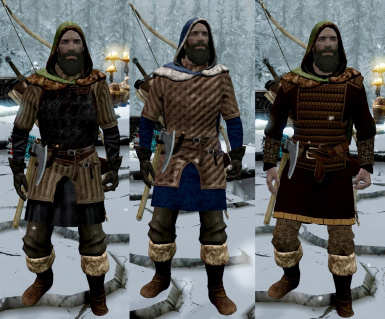 Added Nord Bandit shields from YAGA, fixed keywords for various armor/clothes, adjusted/added to leveled lists and shop inventories. 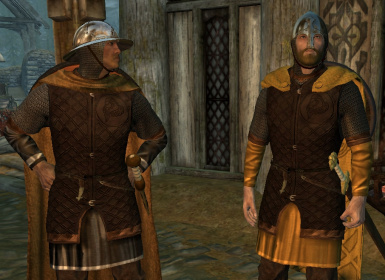 Adds new outfits for housecarls, stewards, thanes, and other members of various courts, as well as embroidered tunics from yoshimuji. Added new Galmar outfit, new Companion's boots, as well as numerous changes/fixes to leveled lists. 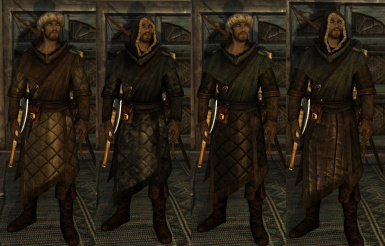 Fixed Bolgier Bearclaw being naked, adds Stormcloak boot variants, numerous fixes and tweaks. 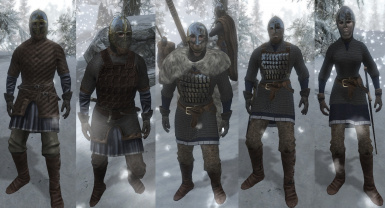 Added Nordic carved armor replacer to mod. 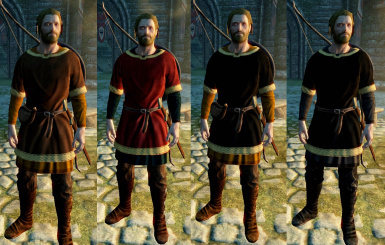 Includes fix for Nordic Tunic (Red) all other Patchfixes. 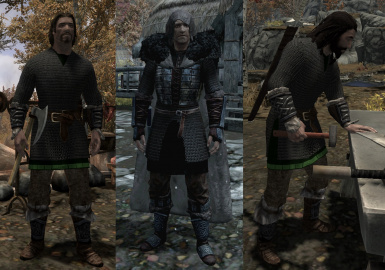 All 3 of V30's mods merged and extended, replacing vanilla steel, leather, Forsworn, Companions, as well as other various helms and armor. Fixed belt on executioner's jerkin. Idiot-proof edition. Hopefully fixed red mantle for reals... knock on wood. Hopefully fixed red mantle texture path issue. Fixed various bugs and added missing meshes. 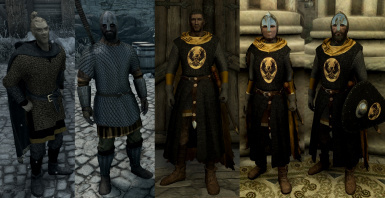 V30E_Dawnguard Patch 1.0--gives the Dawnguard and Vigilants of Stendar new surcoats, also gives adds variant armors and changes both factions outfits to add more variety. You must download Hotfix 3.2 for the new assets, and load V30E_DawnguardPatch below the main mod--it's dependent on it, not a standalone--or you'll get a ctd. 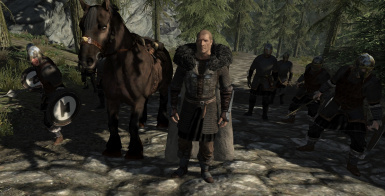 Added support for Helgen Reborn. Added support for BS Bruma. Added Vaultman30 Armor Extended. Various fixes will be added and uploaded as needed. 1.I've merged all three of Vaultman30's mods--YAGA, Simple Hauberks, Early Medieval Helms, including the early version of the helms--into one esp. I also added beast race compatibility thanks to aicy! 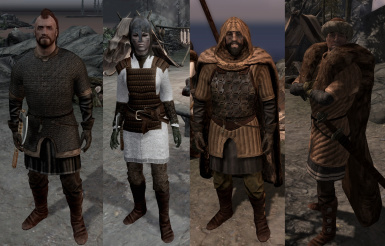 2.Created dozens of re-textures, adding color variants to all V30's armors, as well as completely new sets, with recipes. Also added guard armors and new stuff to shops where it makes sense--for example, you can buy a set of guard armor at the local blacksmiths, padded and other light armor where hunting supplies are sold, etc. 2.Replaces vanilla steel, iron, banded, orcish, leather, hide, scaled, Elven, Glass, Nordic plate, vampire, and studded armors, including adding numerous variants to shops/leveled lists. 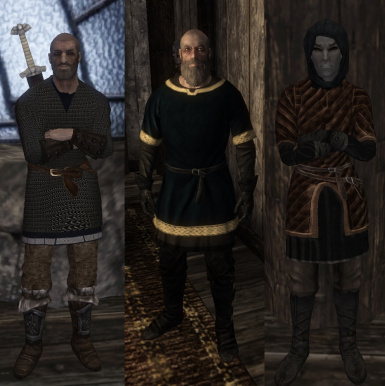 3.Thieves guild--replaced all the various guild armors, including Karliah and Nightingales--new padded leather and mail byrnies, leather gloves from Credo--as well as changes to outfits/leveled lists. 4. 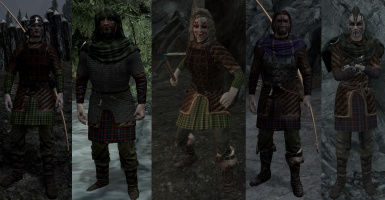 Forsworn--added numerous variant armors, helms, and hoods--Celtic inspired tartan--all temper-able, replaced Armor of the Old Gods with a new mail byrnie and tartan tunic, and added to appropriate shops/leveled lists. 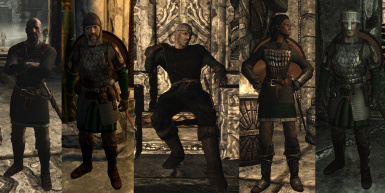 4.Companions--replaced wolf armor as well as added variations for other guild members via outfit and leveled lists. 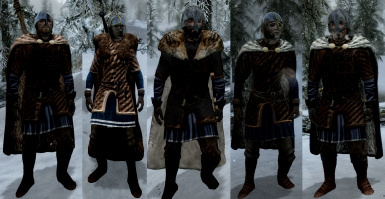 5.Stormcloaks--added several variant armors, helms, and boots to the leveled lists to give the Stormcloaks a less uniform look, more like a rag-tag militia. See pics above, which shows only a few of the many options possible. 6.Vigilants of Stendar--added various appropriate helms to the outfits/leveled lists, and added new mail hauberks from Archdukeoflandsee. 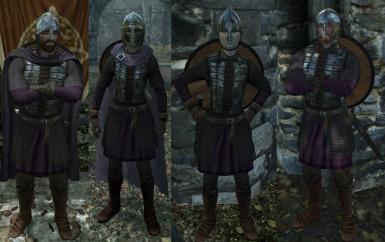 7.Dawnguard--added various appropriate helms to the outfits/leveled lists. Replaced the heavy armor woth Croc's Cyrodiilic Chainmail. I also suggest using Improved Closefaced Helms for the heavy Dawnguard helm--as well as the few remaining vanilla helms not replaced by V30E. Just be sure to place it above V30E in your load order. 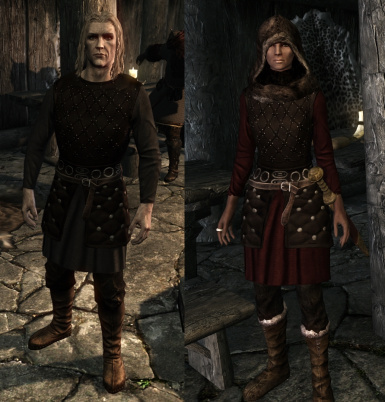 8.To help add to the more historical vibe, I replaced much of the vanilla Nord clothing with new V30 tunics, re-textured merchant dresses in multiple colors for females, as well as variant textures of the leather jerkin from Croc's awesome Norse Viking Chainmail. 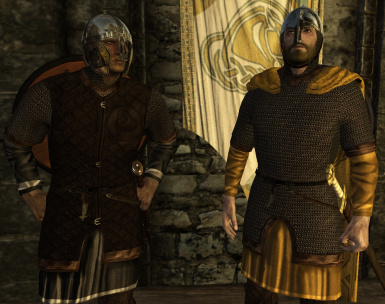 Also added new jarl clothing, as well as executioner's armor, adding all to leveled lists/outfits. 9.Replaced Deathbrand and Nordic carved armor from Dragonborn, with new cuirass, helms, bracers, and boots. 11.Added embroidered Nord tunics by yoshimuji! which use the wealthy clothing keyword. 12.Added temper-able Nord bandit shields from YAGA. All shields are DSR ready--the meshes already included--just run your patcher! 13.Added appropriate armors for various mercenaries, including Black-Brier and East Empire guards, Blackblood Marauders, ect. 14.Added superb new meshes and V30 re-textures by Grey_hunter, which adds numerous helms and shields to the game. 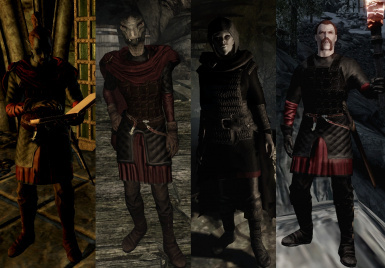 15.Replaced Dark Brotherhood shrouded armor and variants with appropriate content from V30. 16.Added shields by TheMalfazar to replace hide, iron, orcish, steel, banded, nordic carved, and stalrhim shields. All new shields are DSR-ready, just run your patcher. To be sure that DSR doesn't get confused and use the vanilla models, you should delete the old shieldonback meshes from the various folders i.e. hide/iron/steel/orcish in your meshes/armor folder. 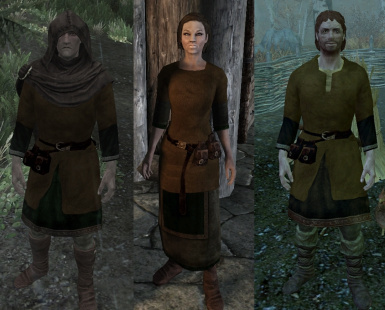 17.Added additional outfits for NPC's all across Skyrim that better reflect their character, i.e. 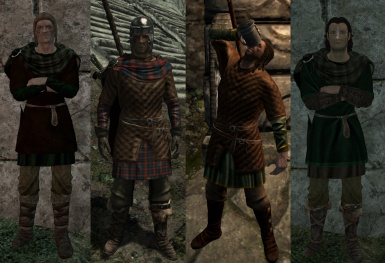 some Bretons now wear Reach tartan; corsairs, sailors, and hunters wear various light armors; Thieves Guild members are now clad in more diverse armor, etc. 18. Replaced orc armor with a new set by Grey-hunter. 19. Replaced Daedric armor with scale and heavy ebony hauberk, using the scale armor mesh from ArchdukeofLandsee. 20. Replaced the vanilla daedric artifact 'ebony mail' with re-textured hauberk from V30's Simple Hauberks. 21.Added leather gambesons and robes from Nernie's Armor Pack. 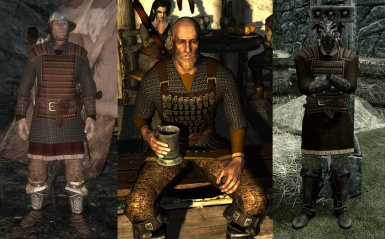 All armors are craftable and temperable, and can be purchased at various merchants who sell hunting and archery supplies and specialty gear (Drunken Hunstman, Grelka's, Niranye, etc.) 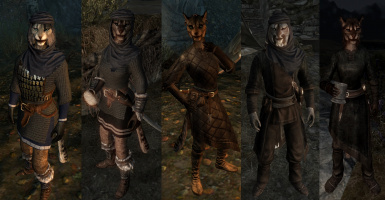 Replaced Summerset Shadows and Karliah's armor with leather gambesons, as well as added the armor to other npc's outfits, specifically the Khajiit caravans, various elves, and the reavers on Soltheim. 22. 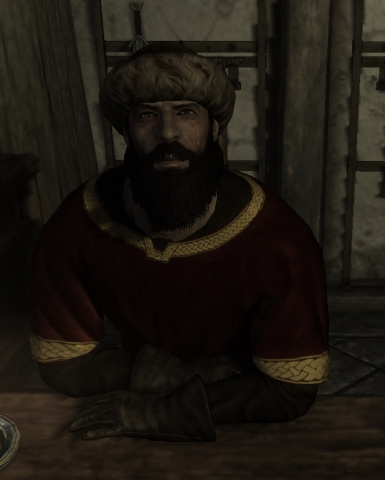 Added Nord merchant clothes and hat variants from Romanov Couture. 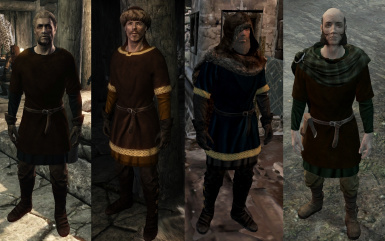 Nordic npc's will now wear a much wider variety of clothes, temper-able light armor versions of the furred hats are available in shops, as well as worn by hunters, bandits and Stormcloaks. 23. Added keyword compatibility for users of True Armor. Each armor now only has one material, allowing TR to more accurately gauge it's protection level. 24. Replaced light and heavy stahlrim sets with armor from Simple Hauberks--the light set is a simple mail hauberk, while the heavy set adds lamellar plates and pauldrons. 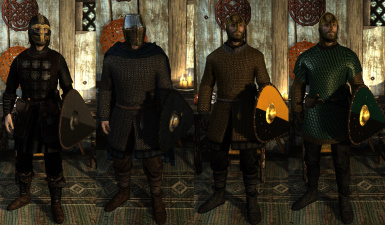 The Early-Medieval Helmets Pack replaces both helms as well, while the gauntlets and boots use the new Nordwar lamellar and splinted steel versions, respectively. 25. Added various superb content from Grey-Hunter and ArchdukeofLandsee. This includes bracers, greaves, helms, shields, and armor sets, reworked by me. 26. 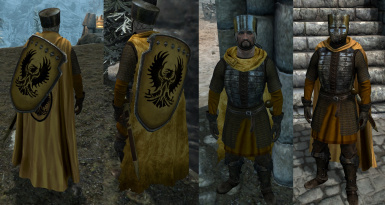 Unique vanilla shields replaced with new kite shield textures--these include Ysgramor's, Auriel's, and Spellbreaker shields, as well as a new leather lamellar variant which replaces the Savior's Hide armor. Load Order/Compatibility--For best results use on a new game, otherwise you may need to use the resurect command to see changes/fix naked NPCs, etc. 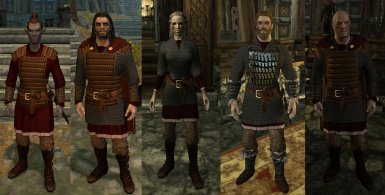 Since it makes changes to many NPC's/armors/outfits, it would be best placed relatively late in your load order, though at worst it should only result in the changes not showing up, nothing game breaking--knock on wood. To get the most out of V30E it should be used with both a merged and bashed patch--I can't stress this enough. See below for details. Current Saves--You may need to use the console command 'resurrect' to re-equip NPC's on a current save game--at least in cells you've already been in. To use console commands press the tilde key '~' in game, then click on the NPC and get their reference id number, then type 'resurrect', without quotes, then hit the 'enter' key, and they should equip the new armor. Bashed/Merged Patches--You'll be best served by using the mod with bashed/merged patches! This way, the changes won't be canceled by other mods. The mod is also marked to Relev/Delev for this reason--though you can always amend this in Wrye Bash, if you wish. 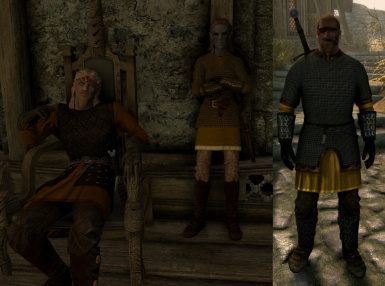 Immersive Armors--Using this mod with mine can interfere with V30E's leveled lists--or any mod for that matter--because it uses scripts to add its armors to the game, which can cause the game to revert to vanilla lists, wreaking havoc with one's save. I stopped using it years ago--it's just too invasive. Also, IMHO, it doesn't add anything that can't be gotten from better sources anyway, mods that have better compatibility with merged/bashed patches. 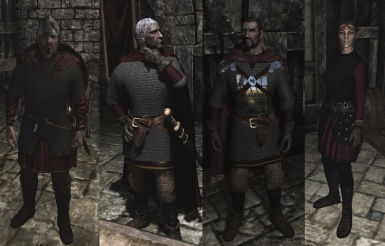 A stand-alone, simple replacer of the Bruma guard's armor, (cuirass, gloves, boots) as well as adds replacers for the new Colovian chainmail (cuiarass, boots), using assets from Vaultman30, and both sets of Colovian fur (both cuiarass) with work from FranklinZunge. 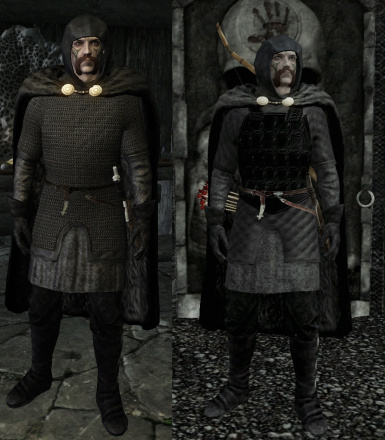 I've also added re-textured cloaks to better match the new guard armor from BS Bruma Tweaks and Enhancements for those that use the cloaks patch, though the mod is not required. NEW! BS Bruma Patch NEW! 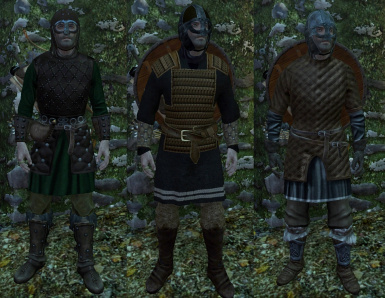 various outfits, adding to shop inventories, adds tempering recipes, makes bandit's wear a wider variety of gear, etc. You won't need the simple original version, see sticky post/change log for more details. Load below V30E main mod. 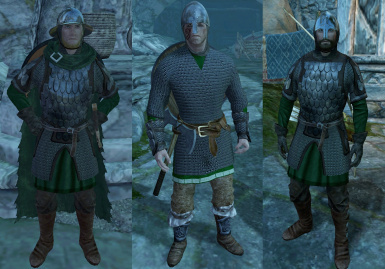 It replaces the Helgen Reborn guard cuirass with a new armor (mail byrnie and light blue tunic) created using Vaultman30's assets. See pic above. 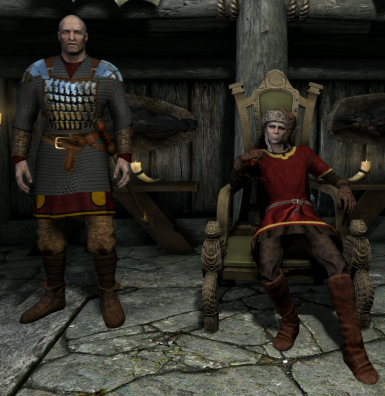 Adds V30E content to Falskaar, replacing both side's armors, including the jarls and their housecarls. You must have V30E's meshes/textures installed for this to work, though it isn't dependent on the V30E esp. Place above V30E in your load order. 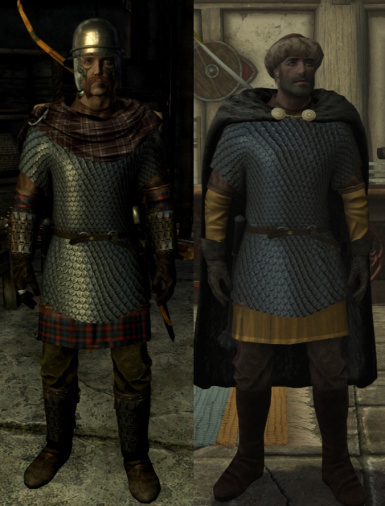 The original version of this mod, which simply extends Vaultman 30's Yet Another Guard Armor to include Stormcloaks--who now use the Windhelm guard armor, with normal Stormcloaks clad in the leather breastplate version, the commanders in the steel version. These changes are included in Vaultman30 Extended, so don't use both, there's no need! To Install--Simply overwrite the Yet Another Guard Armor esp--though be sure to keep the meshes/textures. Replaces all Imperial armor, shields, and helms with V30 content. You must have all the meshes/textures included in the main mod. Place the Imperial patch just below V30E in your load order. If you use DSR, remember to run your patcher, so the new shields are recognized. 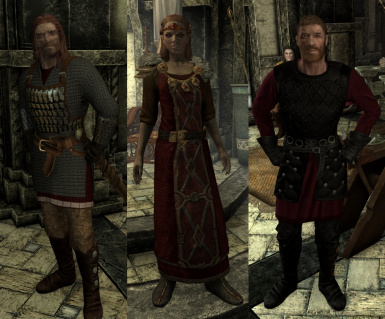 Helps integrate 3DNPCs and V30E, fixes discrepancies in various 3dnpc outfits, replaces armors for the Blood of Skyrim and Garbania's guards, adds appropriate guard armor to Falkreath and Morthal merchants added by 3dnpcs. 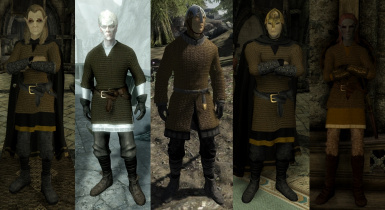 Gives the Dawnguard and Vigilants of Stendarr new surcoats, also adds variant armors and changes both factions outfits to add more variety. You must download the latest Hotfix, and load V30E_DawnguardPatch below the main mod--it's dependent on it, not a standalone--or you'll get a ctd. DSR users will need to re-run their patchers for the new Dawnguard shield to be worn on back. Suggested Mods--These mods go great with V30's stuff. 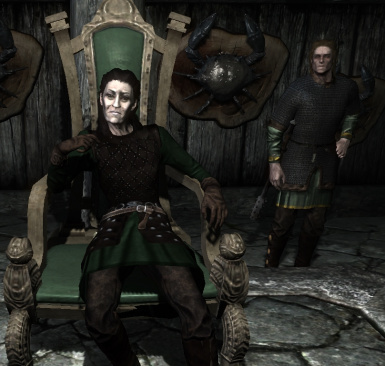 Loading Screens--The Elder Scrolls General Load Screen Replacer keeps the vanilla models replaced by V30E from popping up in your loading screens. It also makes the whole game much more immersive. 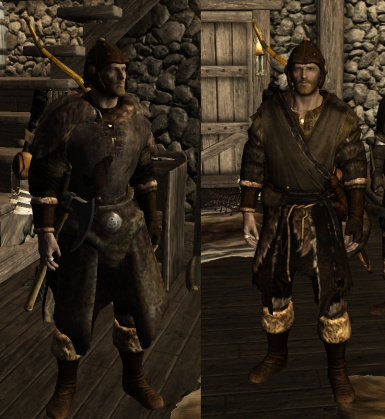 1.Gamwich's Rustic Clothing really compliments V30E, as it improves many of the armor's pants textures, as well as boots, hoods, gloves etc. and makes everything pop just so. 3.Gemling Queen Jewelry--gives the rings and necklaces a real 'Dark Ages' look, making them actually look as if they are crafted by skilled hands. 4.JS Circlet Replacer--makes the circlets match Gemling Queen ring textures, making them actually bearable. 1. 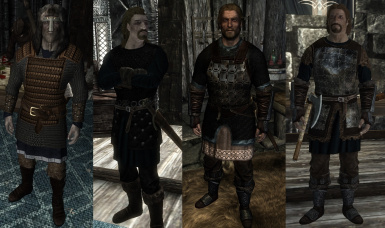 Comprehensive Sleeve Pack--A great mod that replaces the hide and fur armors with content from Brigandage. Adds sleeves to most vanilla clothes and armor, including mail to the iron set (which I have a re-texture for, if people are interested.) Load before V30 Extended for best compatibility. 2.Roman Imperial Armor and Weapons--For those who don't want to use the V30E Imperial replacer patch, this version of Jedo Dre's fantastic Historical Revival is a good option. 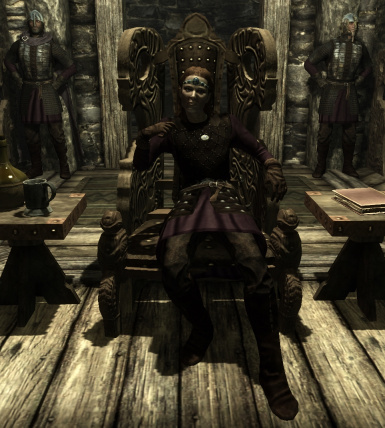 It really compliments V30's Stormcloaks, and gives the civil war a real historical verisimilitude. As is, the Celtic and Germanic component isn't compatible with V30 Extended, unless you tweak it yourself in the Creation Kit. If there is enough demand and I can get permission, I'd be willing to release my modified esp. 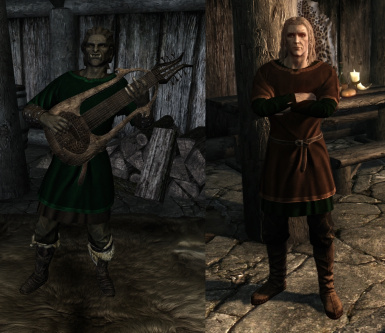 which adds the Celtic armor and weapons to the Forsworn leveled lists, making it compatible with a bashed/merged patch. 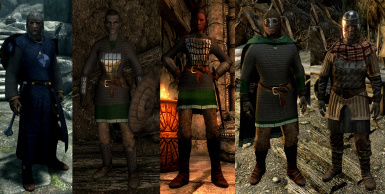 3.Alternative Scaled Armor--Defunkt's mod replaces the scaled armor with a much better model with mail byrnie beneath. 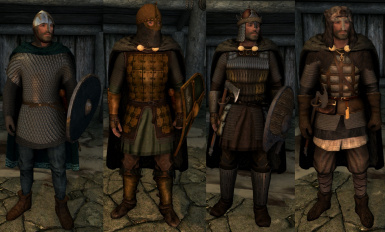 Now that the latest version of V30E replaces scaled armor, use the standalone version, which adds them to the leveled lists and crafting recipes. 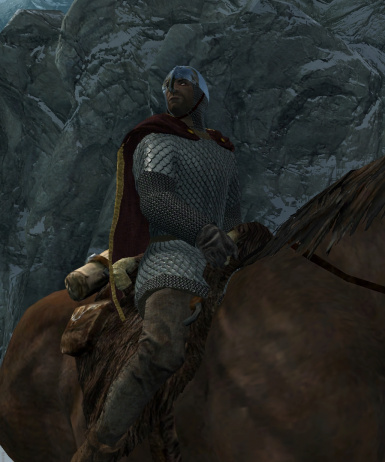 4.Dawnguard Heavy Armor with Hauberk--Also from Defunkt, this adds a mail hauberk under the heavy Dawnguard armor. I've re-textured this with the same mail used in V30's Simple Hauberks, if anyone is interested. Weapons Check out the beta V30E weapon replacer in the main download section! It uses assets from many of the mods listed below. 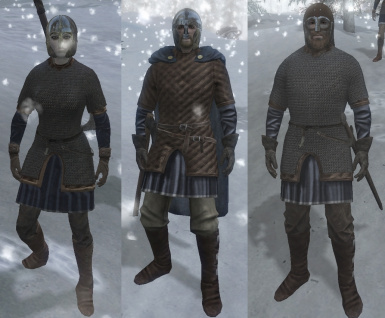 1.Bob's Armory Iron and Steel Replacers--A simple replacer mod for Nordic steel and iron weapons from Bob's Armory. 2.Regent Armory--These are really beautiful, realistic weapons. The two-handed claymore makes a great iron greatsword replacer. 3.Chronicles of Steel--Realswords is a must have mod--it's what I use to replace many of my steel and iron weapons, as well as add to the Imperial arsenal. I also use it to replace most of my arrows--steel, iron, Forsworn, Orcish, etc--using the TCoS Nordic arrows as well as the newer Imperial models. Even if you don't use it as a replacer, it adds a slew of great weapons to the game. 4.Roman Imperial Armor and Weapons--This mod makes both lists because it's great, and for the simple reason that it replaces the terrible paddle-gladius vanilla Imperial swords. If this mod is placed above V30E in your load order, it will still replace the Imperial weapons, while V30E's armor changes will win out. Of course, merged/bashed patches are still recommended. I'd also recommend the celtic weapons--cherusker and the hand axes--to replace the vanilla Forsworn weapons. 5.Real Bows--Honestly, if you're still using those abominable vanilla bows I truly feel sorry for you. Use this mod... now. 6.Unique Bows Collection--Before Real Bows came around this is what I used to replace most of my vanilla bows. Now I use it to replace the ones that Real Bows forgot--and the Real Bow models I don't like as much. It also adds a bunch of cool, unique bows around the world as quest rewards. like the longbows, which I use as a replacer for the vanilla Forsworn bows. 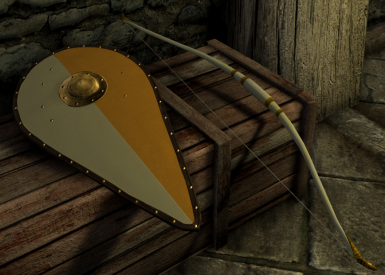 8.Somewhat Historically Accurate Weapons--Great looking, realistic weapons and shields. I use many of them to replace various vanilla unique weapons in my game. 10. 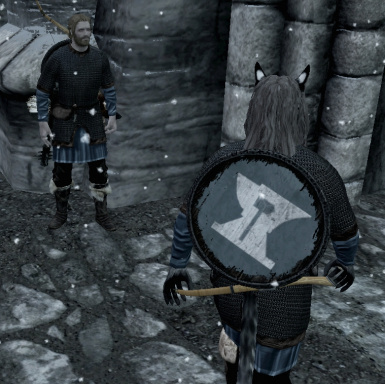 LeanWolf's Better-Shaped Weapons--For those who want an easy option, this mod makes the vanilla weapons more bearable, and also helps fill the gaps left by other less expansive replacers. 11.SBO - Skyrim Blade Overhaul--Another vanilla weapon mesh replacer, which can be mixed and matched with LeanWolf's mod. I actually prefer some of these meshes, and at one time used it quite extensively. 12. Skyrim Weapon De-LARP-ification Project--Gets at some weapons missed by the previous two. 13. Moraelin's Maces--I use these models to replace most of my vanilla maces. They're actually the correct size, graceful and realistic--instead of the huge unwieldy clubs, we see all too often. 14. 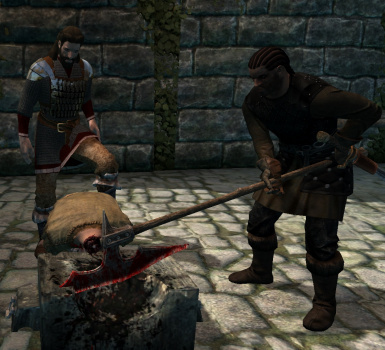 Andragorn's Axes and Maces--I use this mod to replace much of my Orcish, ebony, and Deadric weapons. Though the designs are definitely fantasy-inspired, they still look as if they could have existed in the real world. 15 Elven Weaponry--For Elven weapons, this mod is hard to beat. I use it to replace Auriel's bow, my Elven, ebony, and glass arrows, as well as add various Thalmor weapons to the leveled lists. 16. Elvish Weapons--I use the un-enchanted versions for my vanilla Elven axes and warhammer. The shield would make a nice replacer as well. 17. Dragon Steel Weapons--I use the clean version of these swords and axes to replace many of my Deadric weapons. Fantastic, yet realistic. 18. Marauder Mace--The only replacer worthy of Horksbane! I probably wouldn't even still be playing Skyrim if it wasn't for his mods, which inspired me to dive back into modding, as well as learning the basics of re-texturing in Gimp. 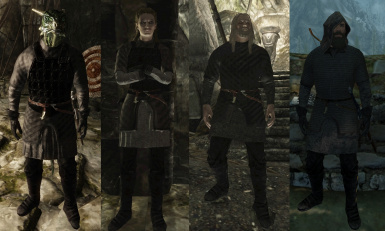 I've had Brigandage and Common Clothes in my load order for years, excellent mods that help make Skyrim a much more diverse world. If you aren't already using his mods, what are you waiting for? Credo's various armors and assets have been used by not only me, but many in the community, in mods large and small, making Skyrim a much more interesting place, to say the least. 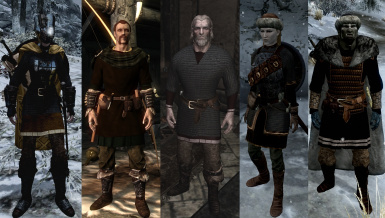 I'm sure most here are familiar with Medieval Skyrim Overhaul, as well as his Northman and Plate Armor, if not, check them out. Ellise's Wayfarer's Coat) inspired me to finish off the last of the main vanilla armors. He also helped me with learning how to edit meshes--Nifscope, and Outfit Studio--so I owe him a debt of gratitude. 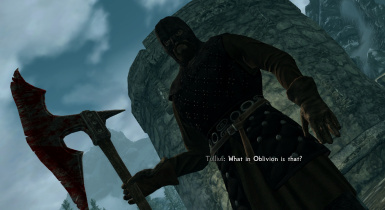 He's definitely, the 'Duke of Skyrim'. Grey_Hunter--a talented Ukranian modder, who has taken V30 original assets to a different level. I've used many of his V30 re-textures in V30E, and it wouldn't be the same without them. 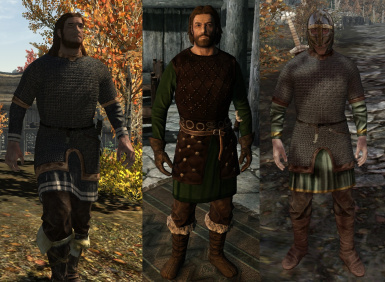 V30E uses assets from Croc's Norse Viking Chainmail ﻿as well as Jedo Dre's Historical Revival, and leather gambesons and robes from Nernie's Armor Pack, surcoats in the Dawnguard patch are from jomalley12211, as well as the other talented modders listed above. 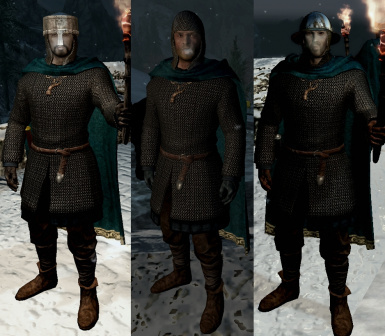 Adds new Bruma guard/iron shields meshes, allowing use with DSR. 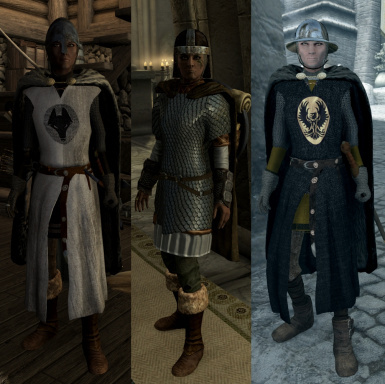 Numerous armor/replacer mods that can help 'historify' your game!